Last summer, during my road trip back east, I drove through the Badlands of South Dakota. Traversing the winding road past majestic, red-striped ancient rock formations, I cranked up the music really loudly, rocking out to the one song that made sense at that moment: “Badlands” by Bruce Springsteen. Because I’m both a literalist, and the sweeping rock ‘n roll from Darkness on the Edge of Town is the perfect soundtrack for the heartland of America. That was on June 26, 2011. Little did I imagine that 521 days later I would be watching The Boss perform that song live in a packed arena, rocking out to an epic concert with the love of my life beside me. I got chills last night thinking about it as he launched into that song, and was instantly transported back in time to last summer, when my life was so different I hardly recognize it now. 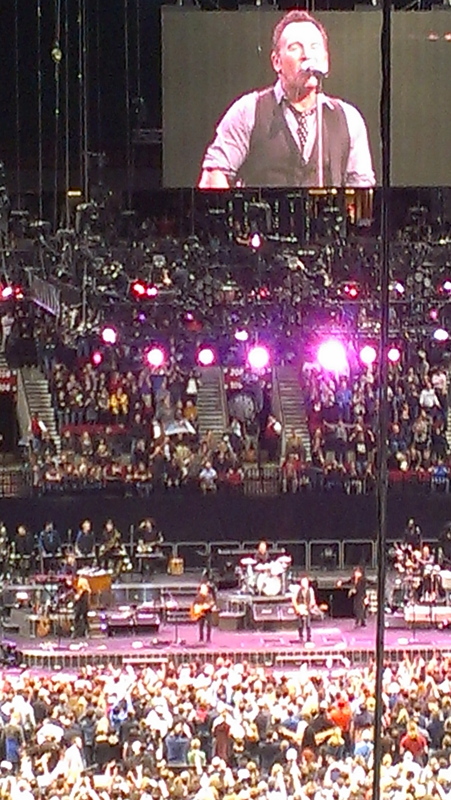 Bruce Springsteen, man. You have no idea what that concert meant to me. I have been a Springsteen fan for almost thirty years. Like so many others, I “discovered” him when Born In The U.S.A. exploded. Bruce was the perfect antidote to the synth-heavy prefabricated music of the early 1980s. The anti-Flock Of Seagulls, if you will. Or Men Without Hats. Or Eurythmics. Springsteen’s music was honest, straightforward rock ‘n roll, and I was instantly hooked. I collected records back then, and bought every single album of his on vinyl. Greetings From Asbury Park, NJ. The Wild, The Innocent, & The E-Street Shuffle. Born To Run. Darkness on the Edge of Town. Nebraska. The River. This music became the anthem of my youth, and Springsteen, my favorite artist. Born In The U.S.A. made him a household name, but it was the older stuff that appealed to me most. Songs like “Rosalita (Come Out Tonight).” “Growin’ Up.” “Blinded By The Light.” “Prove It All Night.” The horns-and-organ riffs from “Tenth Avenue Freeze-Out.” The stark, acoustic hopelessness of “Johnny 99.” The best songs are the ones that never reach the Top 40, anyway. I’m convinced that this is true of all music. I almost got to see Bruce play a concert in the Bay Area in 1987, but it never happened. The person I was with at the time wouldn’t have appreciated his music, anyway. But Tara does. It’s no wonder, then, that I was giddy all day yesterday, leading up to the concert. Over and over, I kept thinking to myself, I can’t believe I’m going to see Bruce Springsteen live in concert tonight! It truly was a dream come true for me. Thank you, dear, for convincing me that $98 plus fees for each ticket would be worth the price. Because after the show, I can easily say I would have paid double for those tickets, and still considered them a great value. Tara came home from work to find me bouncing off the walls with excitement. 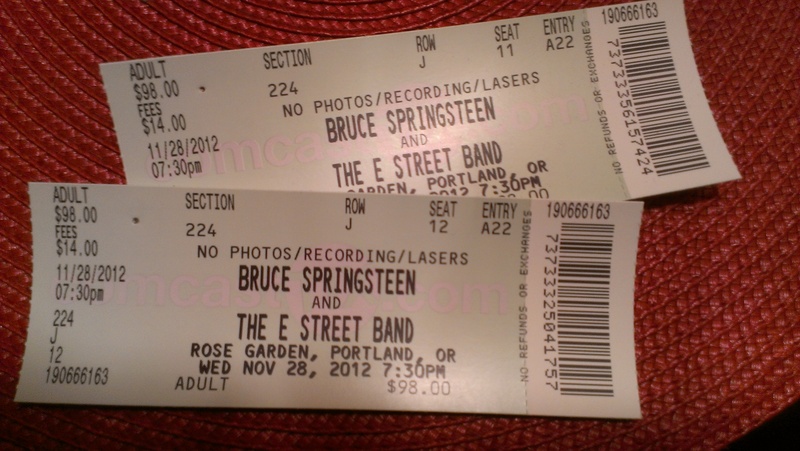 We stopped for dinner at our favorite local Chinese restaurant, then headed to the Rose Garden Arena in Portland, where we joined 15,000 other Springsteen fans for an opportunity to see our hero. He took the stage 45 minutes late, but immediately made up for his tardiness by launching into some serious rock ‘n roll. Backed by fifteen other people – The E Street Band (including Jake Clemons on saxophone, the nephew of Clarence), a horn section, a gospel section – they kicked off the show with “Land Of Hope And Dreams.” Tara turned to me and said, “He’s such a stud.” And he is. 63 years old, and the guy looks – and acts – like a man half that age. By the third song, he was crowd surfing while the entire arena belted out the words to “Hungry Heart.” God, I had chills down my spine! He also jumped atop the piano, walked through the floor crowd, and was playful, funny, and chock full of energy all night long. During the intro to “My City Of Ruins,” he talked about honoring ghosts, and made references to Clarence Clemons and Dan Federici, both members of The E Street Band who have since passed away. He talked about how the song was written for his adopted hometown of Asbury Park and its struggle to escape from an economic quagmire, and how the rejuvenated business district had been dealt a setback by Hurricane Sandy three weeks ago. The chorus – “come on, rise up!” – became a fist-pumping exaltation to overcoming adversity. More chills. The man. The legend. The Boss. He then started taking requests from people who had brought signs to the show. One very lucky guy carried a sign saying It’s My 50th Birthday. Growin’ Up! Great, old song from Bruce’s first album. “I stood stone like at midnight, suspended in my masquerade/I combed my hair ’til it was just right and commanded the night brigade.” THIS is why I love Springsteen. His lyrics are rich and poetic, each song an epic tale. And then he had the birthday guy join him on stage to help him sing the song! Another woman created a roulette wheel, and he invited her onstage to spin it. “Employee Appreciation Night” came up, and Steve Van Zandt was allowed to choose a song. He picked “Loose Ends,” an outtake from The River that I had never heard before. More people came on stage: a group of women wearing “Lesbians Love Bruce Springsteen” t-shirts danced while he sang “Darlington County,” one of the most under-appreciated songs from Born In The U.S.A.. Two young girls helped him sing “Waitin’ On A Sunny Day” (even if they weren’t overly familiar with the lyrics). And, of course, he danced with several women during “Dancing In The Dark,” recreating the famous music video in which he plucked a then-unknown Courtney Cox from the crowd to dance with him onstage. The concert ended with “Thunder Road,” but ended is a relative term because, of course, there would be a few encores. After all, Bruce hadn’t yet reached the three-hour mark. The lights had barely dimmed before he and the E Street Band were back onstage, plowing through “Born To Run” and “Rosalita” and – because this is the holiday season – “Santa Claus Is Comin’ To Town.” And then it ended, for real, with “Tenth Avenue Freeze-Out.” Midway through the song, Springsteen said, “this is the important part here” when he reached the line about Clarence Clemons. “The change was made uptown and The Big Man joined the band.” The music stopped suddenly, the lights dimmed, and a video montage of Clemons over the years filled the screen, a loving, three-minute tribute to the late, great saxophone player that brought quite a few in the audience to tears. Then the song resumed, the crowd went nuts, and it was over. What a performance. It was absolutely incredible. Tara and I see a lot of shows – we’ve probably been to twenty this year alone – but Bruce Springsteen was the best concert of my life, a sentiment echoed by my girlfriend. It’s going to be hard to ever top that one. It was after 12:30 by the time we got home, and we were both pretty wired, so we didn’t fall asleep until well past 1:00. I am operating on about four hours of sleep today, and in the midst of training my replacement, who takes over for me on Monday…since tomorrow is my last day of work here! Fortunately, we’ve covered lots of ground this week, and he’s pretty much already running the show at this point. If he gets a procedure wrong next week, we’ll just blame Bruce for keeping me up late on a school night. Drove through the Badlands ? I did not see you here in Miami. Different kind of Badlands, Carl. Rock formations and green prairies. Not drug dealers and pink flamingoes. Oh, what a great day! We were stuck here in Edmonton with only Paul McCartney in town & unfortunately I did NOT have tickets. What a great day for the North West! Paul McCartney would put on a pretty good show too, I’m thinking! I knew this was going to be a great post and you didn’t disappoint. So happy that you and Tara were able to experience this together. It will certainly be a wonderful memory that you will be able to share whenever either of you hear him sing. How awesome is that?!? It’s amazeballs. Truly. If you ever get a chance to see him, Tracy, by all means – don’t even hesitate. The Boss is totally worth it! Gosh, that sounds like an incredible concert. When I was feeling most homesick and isolated in post-earthquake Haiti, I used to play Born in the USA over and over on my iPod. It helped. Born In The U.S.A. will always remind me of my early teen years in South Dakota. Ahh…such good memories. No wonder I like him so much! And I gotta tell ya, I would have been excited as well because he ROCKS! Not only do I enjoy his music, but I think he’s got a one-of-a-kind voice. I freakin’ love the photo you took of the stage with Bruce on the big screen. Thanks for sharing this experience, bud! Very cool! You should have seen the excitement on my face, Ron! Tara got a kick out of that. I kept randomly squeezing her and uttering, “we’re about to see Bruce Springsteen!! !” WIth anywhere from 3 to 7 exclamation points tacked onto the end of that sentence, depending on my excitement level at any given moment. SO…what IS your favorite local Chinese restaurant? Well, it USED TO BE Szechuan Northwest on Mill Plain, until they closed. Then it was Great Wall on Mill Plain, until they closed. (I don’t like that trend!). Nowadays it’s Imperial Palace in Orchards. Hey, at least it’s closer to home. Love this post. I mostly remember whole years of my life by what show I got to witness. Sixth and seventh grade was a low point (N*SYNC, Hanson, Back Street Boys), but I’ve gotten better with age. I think I just turned green with envy! I would love to see Bruce! Love! Love! Love him! If you’re that big a fan, then you would have LOVED the show! By all means check him out if he comes through your town. It’ll be an experience you’ll remember forever. I will be the first to get tickets! Magic is one of my favorite albums of all time!